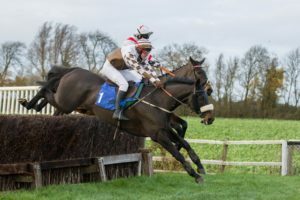 Five times National Ladies Champion, Gina Andrews, made it a day to remember at Cottenham on Sunday when riding her 200th Point to Point winner. Gina was partnering the Alan Hill trained Sharp Suit who loves Cottenham and made all to win going away from favourite Net D’Ecosse. Gina must surely be as keen on Cottenham as Sharp Suit, the track has seen some of the major milestones in her illustrious riding career. It was here that Gina rode her first winner on her first ever ride back in the February of 2008 just a week after her 16th birthday aboard Moving Earth. That day set Gina on a path to becoming one of the best amateur jockeys of a generation. Two years ago at this Cottenham meeting Gina rode her 200th career winner (point to point, national hunt and flat), her total winners across all codes now stands at an amazing 262! 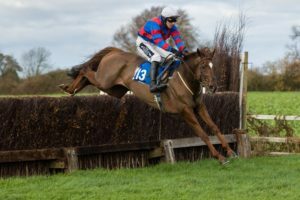 The record for Point to Point winners ridden by a lady jockey is held by Polly Gundry at 303 winners and Gina now has her sights firmly set on beating this record. She was full of praise for Sharp Suit and his trainer Alan Hill and was thrilled to have got the 200 up for the Hill’s who have provided her with a huge number of winners in recent seasons and it was a great sight to see her cheered in to the winners enclosure by the Hill team, her family and husband Tom. Whilst Gina was the star of the day her younger brother Jack was also seen to great effect when winning the 2m4f maiden aboard Captiva Island, making it a double on the day for trainer Alan Hill. 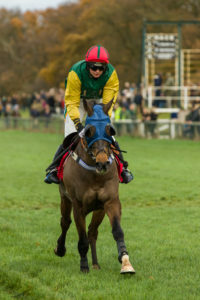 Jack gave the horse an ultra-confident ride, not committing for home until after the last fence. Joe Hill, Assistant Trainer to his father Alan, was full of praise for Jack who has really stepped out of his older sisters’ shadows in the last couple of seasons. The award for gamest performance of the day must go to the winner of the Men’s Open, Now Ben. Having made all the running Now Ben was taken on for the lead by favourite Just Cause (Jack Andrews) three fences from home but regular pilot Alex Edwards didn’t panic knowing that his mount would pick up again on the run for home and sure enough as the pair came off the final bend it was Now Ben who stayed on the strongest to win by a length. 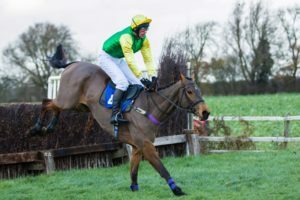 Edwards, last season’s National Champion, is clearly very fond of Now Ben a prolific winner whom he has partnered in all but one of his point to point wins. 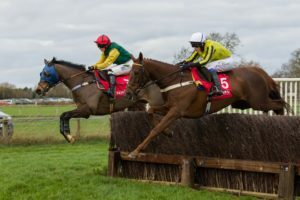 Alex said “the track and the ground at Cottenham really suit Now Ben as he can be a bit free in his races, I knew I didn’t need to panic when the other horse headed me and that he would see the race out well. 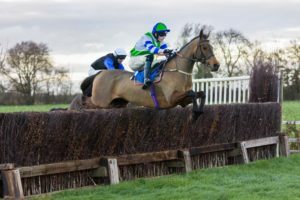 He will probably follow a similar program to last season and aim for the Champion Hunter Chase at Stratford at the end of the season. Despite a small number of entries there was some really high quality racing and a huge amount of excitement in all the races on the card. 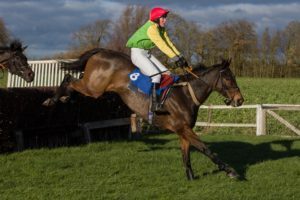 Point to Point stalwart and regular visitor to East Anglia Laura Thomas, riding the evergreen Karinga Dancer, stormed home in the opening 2m4f conditions race to win by 8 lengths from his nearest rival. The day also saw a first career win for Josh Lovegrove Fielden winning the restricted race aboard Urban Storm by an impressive 12 lengths, making the long trip from Wales more than worthwhile. The closest finish of the day came in the 3m maiden when Gina nearly made it 201 with Latenightpass but was out sprinted on the run for home by the Francessca Nimmo trained Black Jewel who got up to win by a head. All in all it was a fabulous days racing with some high quality competitive fields and it will be great to be back at Cottenham for the next meeting on 30th December.